As we enter The NCAA Final Four Weekend in San Antonio, I am energized to look forward to another great year of collecting NBA Basketball cards. 2017-18 Basketball products have been the most anticipated and successful in many years. When looking at the 2018 NCAA Tournament, the drama and excitement got me thinking 2018-19 Basketball might just be even better. The upcoming 2018 NBA Draft will be full of NBA ready talent with Deandre Ayton, Luka Doncic, and Marvin Bagley III on the experts' consensus top three picks. 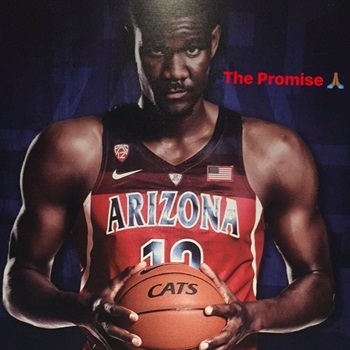 My pick for the best all-round player in this year's NBA Draft is Deandre Ayton. The experts' general comparison is to David Robinson and that may have influenced my selection of Deandre Ayton as my number one. The 2018 men's NCAA tournament lost more than a handful of top teams over its opening weekend. The field also witnessed the departures of several of the NBA draft's top prospects. In other words, there's no more game information to gain on the likes of Deandre Ayton, Jaren Jackson Jr., Mohamed Bamba and Trae Young. But since their scouting reports are already well-documented, that should make it easier to project how things will transpire inside the Barclays Center on June 21. Our first-round draft board includes eight prospects who are still alive in March Madness. While Bagley and Wendell Carter Jr. don't have much room to climb given how early they're going, the other six could all boost their stocks at the Big Dance. Villanova's combo of Mikal Bridges and Jalen Brunson are likely hurt by their age and perceived lack of upside. They can challenge that narrative by exceeding expectations on the big stage. Neither has really erupted yet, but Bridges came into the tourney scoring 23-plus points in four of his previous five outings, and Brunson delivered a 31-point, eight-triple gem in the Big East championship. The bracket is set up for Kentucky to potentially make a deep push, which would increase the exposure of Kevin Knox and Shai Gilgeous-Alexander. The latter has already helped himself with an explosive stretch (23.5 points, 6.3 rebounds and 6.0 assists over his last four games), and the former boasts an NBA-friendly skill set of two-way versatility and three-point potential. Finally, it's hard not to notice Robert Williams or Zhaire Smith when either takes the floor. They might be going head-to-head for the tourney's top dunker.